Thank you to all who came to our St. Joseph Parish 150th Anniversary Picnic on Sunday, October 1, 2017. Food was great, games were lots of fun, and it was a wonderful community event! Please click here to read more and view photos. Many thanks to all who attended our special 150th Anniversary mass on Saturday, May 20th and the reception. Everyone had a great time, the catered food was delicious and the many pot luck dishes were fantastic. The generosity was overwhelming! Our entertainment from Frank Rossi and company was delightful. There are so many people who are on the Anniversary Committee who worked many, many hours who were already named in last week’s bulletin. There were a few volunteers who should also be recognized who helped with many tasks: Roger Wells, Danielle Wells, Russell Wells, Pete Bryczek, Frank Ziolkowski, Jim Morris, Hap Arentz, Knights of Columbus, Council 8082, Bridget Barnett Choe taking photos for facebook, Deanne Holmes as our photographer, our Choir under the direction of William Coble, and George Kucka as MC. A special thanks to Pepsi for their donation of the soda and water. If I missed someone, I truly apologize. Also for the good service and the lower rates from Rob’s Catering in Dyer and Twisty Designs for the balloon decorations also here in Dyer. We also especially appreciate Bishop Donald J. Hying for coming to celebrate this special mass along with Rev. James Meade, son of this parish and of course, our Pastor to be, Father Ted J. Mauch. God bless all! This is St. Joseph Parish’s special weekend. On Saturday, May 20th, Bishop Hying will be celebrating Mass at 4:30pm starting this special year of events. Father Ted Mauch, (our pastor officially in a couple months) and Father James Meade (originally from St. Joseph Parish) will concelebrate. Gary Blue (our Deacon to be next month) will be assisting. 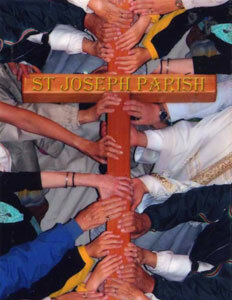 GOD BLESS ST. JOSEPH PARISH, ALL OUR FAMILIES, ALL THE PARISHIONERS WHO ARE IN ALL OF OUR MINISTRIES AND ALL OUR GUESTS. 150th Anniversary Books are still available for sale at $20 each. You may come to the parish office or call, 219-865-2271. Stay tuned for events to happen throughout this year to celebrate our 150th Anniversary.